A number of members of the Finger Lakes Guild were able to attend the White Mass celebrated this past October in Washington, D.C. during the annual meeting of the Catholic Medical Association (do you recognize anyone in the front row?). The Mass was celebrated at the Basilica of the Immaculate Conception, the largest Church in North America. This magnificent celebration was magnified by the incredibly beautiful surroundings and music. Our hearts were collectively stirred as we celebrated the Eucharist together with so many of our dedicated, Catholic colleagues. In turn, the Finger Lakes Guild sponsored the White Mass here in Rochester in early November. Bishop Matano celebrated Mass for the some 100 people in attendance. His Homily was direct and most inspiring, recognizing the challenging culture we live and work in, yet supporting us in our moral endeavors. The Bishop also gave a special blessing for the new officers. The White Mass was followed by a pleasant brunch reception. 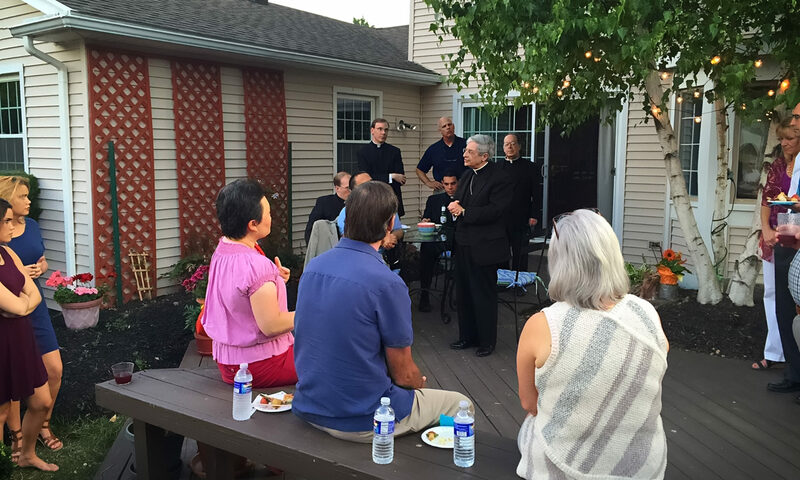 We were thrilled that Bishop Matano and Father White were able to spend so much time with us relaxing and enjoying the delicious food. It was especially appreciated that so many medical students and residents were able to attend as well. A special thanks to the St. Anne community for hosting us in their beautiful Church, with such excellent music, and allowing us to have access to their reception hall. Let me recognize Jann Armantrout, in particular, for her invaluable assistance in planning and running this special event.